The 1981 Ryder Cup does not figure high in the ranks of sporting memories this side of the Atlantic, and for good reason, given the American dominance at Walton Heath that blew the opposition away. Nevertheless it proved a turning point for the fledgling European side and signalled the end of a magical era for the Stars and Stripes that saw a roll call of golfing greats represent their country. Thirty years on from the seminal three days in mid-September, a select few of the players on show back then made a pilgrimage of sorts when the Senior Open visited the notoriously tough Surrey course again in July. Much changed from its Ryder Cup layout of old, it’s easy to forget that Walton Heath was lucky to host the biggest team event in golf at all. The Brabazon course at The Belfry had been earmarked for its debut, but many felt it was not of a sufficiently high standard – and it would be 1985 before its first taste of Ryder Cup action resulted in a memorable victory for Europe. In 1979, John Jacobs’ inaugural European team had fallen 17-11 to Billy Casper’s side at The Greenbrier in West Virginia. No disgrace, considering the weight of expectation heaped upon them. After all, Casper could call upon Larry Nelson, Hale Irwin, Fuzzy Zoeller and Lee Trevino to provide the backbone of his team, leaving Jacobs’ intriguing mix of wisdom and youth in their wake following a potent Sunday morning singles surge. Two years later Jacobs was deprived of rising star Severiano Ballesteros, while veteran mainstays such as Tony Jacklin and Brian Barnes left the fold to make way for the likes of debutants Bernhard Langer and Sam Torrance. It was supposed to mark the start of an exciting European era, thanks to Seve’s superb Masters win in 1980 that had come on the back of his Open success at Royal Lytham & St Annes. The American team, though, had other ideas. Captain Dave Marr possessed a wealth of stunning talent to combat Jacobs’ every move and the hazardous heather that peppers the fascinating set-up. Before the first tee shot was hit in anger, Marr’s team had already racked up 38 Major victories between them with Jack Nicklaus accounting for 17 of them on his own. More to the point, Tom Watson, Bill Rogers and Nelson had each lifted Major trophies in 1981 – Australian David Graham spoiling an American clean sweep with a classy US Open win in Pennsylvania. The only player in the 12 who failed to win a Major at all in his career was perennial PGA Tour winner Bruce Lietzke, his 2003 Senior US Open win over Watson going some way to filling the void. Ben Crenshaw went on to claim the Masters Green Jacket in 1984, and so memorably again in 1995, with Tom Kite finally breaking his duck after edging out Jeff Sluman and Colin Montgomerie at the US Open in 1992. Despite this, the course layout was tipped to trip the world beaters up and favour the Europeans. Small, tricky greens, allied with fast fairways and the pesky heather were largely alien to the Americans. This supposed advantage was negated slightly by Seve’s absence, the acrimony over a long-running European Tour money dispute forcing Jacobs’ hand. Not only that, the European team had not one Major victory to call their own. If you had seen the opening day’s play, you would be forgiven for thinking that the Europeans were on the verge of a miraculous victory. Rain and thunder threatened to cast a veil over proceedings, the home side coping much better with the sodden course conditions. The morning foursomes were shared two apiece, Sandy Lyle and Mark James combining to down Rogers and Lietzke with Bernard Gallacher and Des Smyth seeing off Irwin and Ray Floyd with ease. Lyle and James maintained their momentum to see off Crenshaw and Jerry Pate in the afternoon fourballs, Scot Lyle finding the hole at will from distance with his trusty putter. Smyth impressed again alongside José Maria Cañizares to thrash Rogers and Lietzke 6&5 into the bargain, the match on a knife edge as the umbrellas stayed aloft on the course. Torrance and Howard Clark then battled back bravely against Kite and Johnny Miller to grab a half, after Torrance’s victory putt on the last agonisingly lipping out. The momentum took a crucial turn for the visitors in the remaining match, Floyd’s heroics in partnership with Irwin breaking the resistance of Gallacher and Eamonn Darcy 2&1. Jacobs’ team sat on a one-point lead heading into Saturday’s matches, but Marr used Floyd’s gallant stand to rouse his troops on Friday evening. Trevino desperately wanted to partner Pate in Saturday’s opening fourball, Supermex’s wish granted by Marr en route to a whopping 7&5 victory over a youthful Nick Faldo and Torrance that sucked the wind out of Europe’s sails. Pate recalled: “Great memories. In those days you couldn’t make the Ryder Cup team until you had played on the Tour for three years. I had qualified before, but wasn’t old enough. For Pate, it proved a welcome moment of success in a promising career dogged by a long-running shoulder injury that eventually cleared up enough for him to be competitive on the Senior Tour again. Looking back 30 years again, Nelson matched Lyle putt for putt in their Saturday morning fourball clash with a birdie on the last to seal a heroic one-hole victory that saw the tide firmly turn in Team USA’s favour. Langer and Manuel Piñero’s 2&1 victory over Floyd and Irwin spared a Saturday sweep; nevertheless the home outfit were five points adrift heading into the Sunday singles. Only brave gamblers would back Europe. The prolific German has mixed emotions about his Ryder Cup baptism of fire, despite the plucky point garnered alongside Piñero. He revealed: “Oh, yeah, I want to forget that one! I’m not sure I learned a lot apart from the fact I had a long way to go and elevate my game to a different level to compete with the very best in the world. I was able to do that in the following years. “I believe it was the best American Ryder Cup team ever. The course is quite different now, because we have different tees and we are playing different holes. Equipment is different too. Heading into the 1981 Sunday singles, Europe needed to win nine out of the 12 points on offer to upset the odds however Trevino dashed their hopes from the off with a whirlwind 5&3 victory over Torrance in two hours and 10 minutes. Kite’s win over Lyle in an epic low-scoring duel that fully deserves its place in Cup folklore, merely rubbed salt into the European wounds. The Scot reflected: “It was a daunting week when you looked at the American side on paper and the amount of tournaments and Majors that one team had accumulated. “As a Ryder Cup team, the European team was still fairly new and we didn’t have Seve that year, which could have been a big help to us. “To lead after the first round, that was great. It showed that we could still perform against the Americans, but we always felt down the line that they might overpower us down the stretch. Despite the fact Gallacher halved with Rogers, Crenshaw sent Smyth packing and Nelson put paid to James on the final green to seal a wet, yet memorable, American victory. The cherry on top for the visitors was Nicklaus’ win over Darcy that saw the Golden Bear finish his emotional Ryder Cup farewell with four points out of a possible four, matching the hauls of Trevino and Nelson. Consequently you can see why many golfing experts hold this team in such high regard and why more recent teams have come in for such flak from the notoriously jingoistic, yet fickle, press back home in the States. For those players coming through the college and professional ranks in the US back then, it proved inspirational and burdensome in equal measure as can be seen from the performances of American sides in contests since. Former Masters champion Larry Mize, a Ryder Cup loser in 1987, said: “I was struggling to get on Tour back then, I was just a young pro. I got on the Tour the next year. When you look at the list of players on that team, it was a great team. The Ryder Cup is a phenomenal event. US Open winner Scott Simpson, another victim of Europe’s rapid progress in 1987’s Muirfield Village loss, backed up his team-mate’s assertion. He said: “It’s a tough course, so if you’re not playing well you can make some big numbers, but Tom Watson said it was a really, really good course and I can see why. John Huston sadly never got to compete toe-to-toe with the Europeans during his successful PGA Tour career; nevertheless he knows the true value of the biennial event. He declared: “There were nine or 10 Hall of Famers on that team. It was crazy. It was my second year on Tour. I actually would have been borderline making that team, but I wasn’t a pro for long enough at that time. It’s one thing to play for your country or continent, another thing entirely to captain the side. Corey Pavin saw his visiting troops lose out to Graeme McDowell and Co at Celtic Manor last year; however he can also draw on winning playing memories from the famous “War on the Shore” at Kiawah Island in 1991 and the 1993 defence at The Belfry. The last word, though, goes to Watson with the spectators who were lucky enough to brave the rain seeing the ageless gentleman partnered with fellow legend Nicklaus. The five-time Open champion said: “We had a wonderful team in ’81. I played with Jack in three rounds out of four, and we won all of our matches before I lost my singles match to Howard [Clark]. “I do remember the first match I played with Jack. We played alternate shot, and I put him in the heather five times. And that’s the key ingredient here of what you can’t do. The rough is very penal if you drive into it. The likes of Faldo, Langer and Lyle would go on to great things individually and at future Ryder Cups, but it was all about the Americans this week 30 years ago. Egos were put to one side, unfavourable conditions played down and magical shots conjured up – a lesson to the current American team for whom the Ryder Cup often comes secondary to blinkered solo ambition. A shame, but a valuable historical call to arms for the home side ahead of Medinah Country Club one year from now when Davis Love III welcomes Jose Maria Olazabal’s team in the first contest since the humble Spaniard’s close friend Seve left us for the golfing Gods. Nice piece. 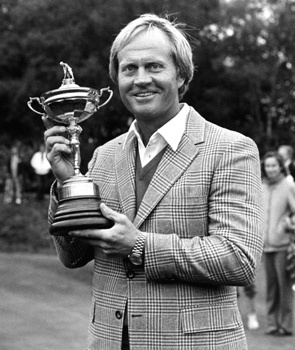 I was wondering why Tom Watson and Jack Nicklaus were not in the 1979 team and just looked it up – Watson had to pull out at the last minute because of the birth of his child and Nicklaus did not even make the team on points (no captains picks in those days). Amazing strength those teams of the late 1970s and early 1980s had, but equally amazing that Europe happened on a golden generation. The Ryder Cup is the best three days of sport on TV each two years. Brilliant stuff. The joys of team golf. The Solheim Cup triumph for the Euro women was a far more special experience and spectacle than the vulgar $11.5m turkey shoot they had in Atlanta yesterday. Great to hear some Golden Oldies remembering a past Ryder Cup Matthew. HD was invented for the Ryder Cup but the history and the US past dominance is what makes every European cup lift so special.